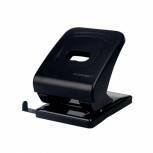 Q-Connect Medium Duty Hole Punch Black 87 Pack of 1 Q-Connect Medium Duty Perforator. 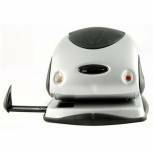 Medium 2 hole desk punch for medium quantities of paperwork. Features include handle lock down device for ease of storage and integrated paper guide for accurate punching. Paper capacity - 20 sheets of 80gsm. 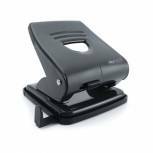 Q-Connect Standard Duty Hole Punch Black 827P Pack of 1 Q-Connect Standard Duty Perforator. 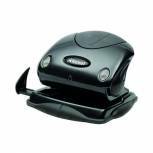 Standard 2 hole desk punch for standard quantities of paperwork. Features include handle lock down device for ease of storage and integrated paper guide for accurate punching. 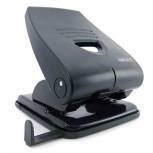 Q-Connect Heavy Duty Hole Punch Black KF01236 Pack of 1 Heavy Duty Perforator. 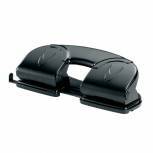 2 hole desk punch for large quantities of paperwork. Features include handle lock down device for ease of storage and integrated paper guide for accurate punching. Paper capacity - 40 sheets of 80gsm. 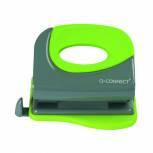 Q-Connect 4 Hole Punch Black KF01238 Pack of 1 Q-Connect Fixed 4-Hole Perforator. 4 hole desk punch with standard 8cmx8cmx8cm spacing. Features include an integrated paper guide for accurate punching. Paper capacity - 16 sheets of 80gsm. 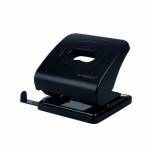 Rapesco Sole Single Hole Punch Black PF35A0G1 Pack of 1 Rapesco Sole Single Hole Punch. Single Hole heavy duty punch, ergonomically designed with metal paper chamber and working parts. Paper capacity is 23 sheets at a time punching a 6mm diameter hole. Colour - Black. 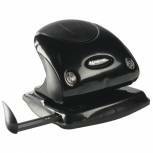 Rapesco 835-P Heavy Duty Hole Punch Black PF835PB2 Pack of 1 Heavy duty two hole punch with all metal workings. Metal base with rubberised confetti tray and handle lock down for easy storage. Integral paper guide for accuracy. 35 sheet capacity. Black. Rexel Choices P225 Hole Punch Black 2100745 Pack of 1 Rexel Premium Paper Punch - P225. Robust all metal 2-hole punch featuring a new ergonomic design with soft feel materials. Hinged confetti hatch. Retractable paper guide and lock down handle. Punching capacity -25 sheets. Colour - Black. Rexel Precision P215 Hole Punch Silver/Black 2100738 Pack of 1 Rexel Premium Paper Punch - P215. 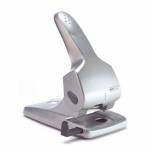 Robust all metal 2-hole punch featuring a new ergonomic design with soft feel materials. Hinged confetti hatch. Retractable paper guide and lock down handle. Punching capacity -15 sheets. Colour - Black and Silver. 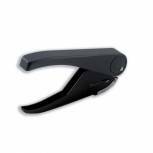 Rapesco 865-P Heavy Duty Hole Punch Black PF865PB2 Pack of 1 Single piece handle design for effortless operation. Two hole punch capable of punching up to 63 sheets (80gsm). It has two 8cm gauge holes. Colour - Black. 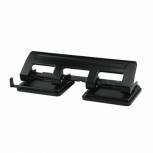 Rapesco 827 Hole Punch Black PF827AB1 Pack of 1 Rapesco 827 Two Hole Metal Punch. Punches up to 27 sheets of 80 gsm paper. With handle lock down switch for easy storage and adjustable paper guide. Colour: Black. 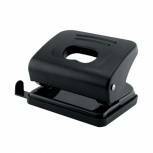 Rapesco 835 Hole Punch Black PF800AB1 Pack of 1 High specified 2 hole punch easy to use with neat lock down for convenient storage. 35 sheet capacity of 80gsm paper with 80mm spacing and 6mm diameter, supplied calibrated with adjustable paper guide for precision use. Colour - Black. 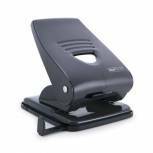 Q-Connect Premium Hole Punch KF00996 Pack of 1 Q-Connect soft grip hole punch. Metal punch with rubber grip punches through 20 sheets of 80gsm paper. 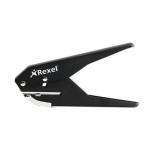 Rexel S120 Single Hole Plier Punch Black 20120041 Pack of 1 Easy punch single hole plier with max. 25mm hole margin. Hole diameter 6mm. Capacity 20 sheets of 80gsm paper. Available in Black. 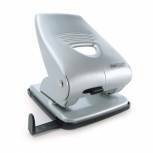 Rapesco Zero-65 Heavy Duty Hole Punch Silver 0732 Pack of 1 Extra heavy duty two hole punch with neat flat open confetti tray. Handle lock down switch for easy storage. Integral paper guide for accuracy. 65 sheet capacity. 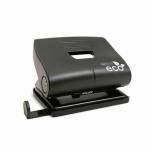 Rapesco Eco Medium Hole Punch Black 1086 Pack of 1 Rapesco Eco Medium 2 Hole Punch. Hole punch with all metal working parts. Features lock-down handle for easy storage and rubberised confetti tray. Rexel Precision P215 Hole Punch Black 2100740 Pack of 1 Rexel Premium Paper Punch - P215. Robust all metal 2-hole punch featuring a new ergonomic design with soft feel materials. Hinged confetti hatch. Retractable paper guide and lock down handle. Punching capacity -15 sheets. Colour - Black. Rexel Precision P225 Hole Punch Silver/Black 2100743 Pack of 1 Rexel Premium Paper Punch - P225. 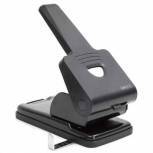 Robust all metal 2-hole punch featuring a new ergonomic design with soft feel materials. Hinged confetti hatch. Retractable paper guide and lock down handle. Punching capacity -25 sheets. Colour - Black and Silver. 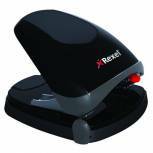 Rexel V412 4 Hole Punch Black 08309 Pack of 1 Economy four hole punch ideal for low capacity use. 12 sheet capacity of 80gsm paper supplied with confetti tray and paper guide. Colour - Black. 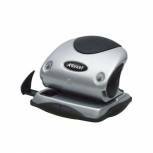 Rexel Easy Touch Hole Punch Black/Grey 2102575 Pack of 1 Rexel Easy Touch Paper Punch. Effortless paper punching with 50 percent less force. Features durable metal construction with rubberised handle cover and base. Handle hold down feature. Hinged paper chip hatch and paper guide. 30 sheet capacity. Rapesco 835 Hole Punch Silver 1024 Pack of 1 Rapesco 835 heavy duty punch with lock down handle for easy storage and adjustable paper guide. Punches up to 35 sheets of paper. Colour: Silver.